S'mores Kit Tote - Microwave Kit includes 2 Graham Cracker Sheets, 2 HERSHEY'S® Milk Chocolate Fun Size Bars (0.5 oz), 4 Marshmallows. Makes 2 servings. 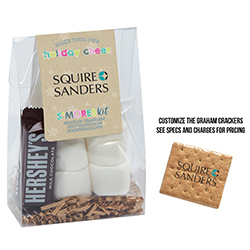 TAPT-SMK S'mores Kit Tote - Microwave Kit includes 2 Graham Cracker Sheets, 2 HERSHEY'S® Milk Chocolate Fun Size Bars (0.5 oz), 4 Marshmallows. Makes 2 servings.